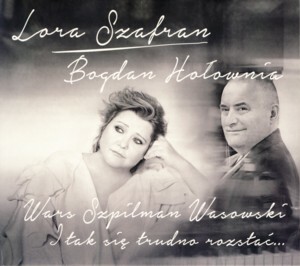 This is a live recording by Polish Jazz vocalist Lora SzafranFind albums by this artist accompanied by a quartet led by pianist Bogdan HolowniaFind albums by this artist, which also includes trumpeter Robert MurakowskiFind albums by this artist, bassist Pawel PantaFind albums by this artist and drummer Sebastian FrankiewiczFind albums by this artist. The album presents twelve Polish evergreens (often called Polish standards), composed by three renowned Polish composers: Henryk WarsFind albums by this artist, Wladyslaw SzpilmanFind albums by this artist and Jerzy WasowskiFind albums by this artist and featuring lyrics by celebrated Polish poets and lyricists. Szafran and the instrumentalist are all veteran performers and professionals, so this material offers no challenge whatsoever, especially in view of the fact that it was meant as entertainment and a nostalgic revisit of this material, rather than a Jazz event. Of course the performance was first class from start to finish. Overall this is a nice tribute to beautiful Polish songs, which offer wonderful music and intelligent, sensitive lyrics, and as such is sadly a symbol of how the values of popular music changed over time from artistry to trash.